swisskubik | 695 € Tax inc. In the world of the Swiss Made watch winder, also for Swiss Made watches, luxury brands are not numerous. As the fine Swiss Made watchmaking is not free of charge, the watch winder that accompanies it is not a free acquisition either. However, the Swisskubik watch winding brand, the swiss kubik model, which sometimes offers free delivery or purchase in Paris, gives Swiss Made watches a luxury case so that each watch has its own individual location, a cube that protects it. In Switzerland, the Swiss Kubik (from swisskubik) is one of those Swiss Made brands that have established themselves through their creativity, luxury and the response to a fairly standard demand in watchmaking. Why? Why? Because for all Swiss Made brand watches, the process of providing them with a luxury rotating case is not free of charge. The Swisskubik brand, with its Swiss Kubik model, offers a Swiss luxury rotary cube that increases the life of a watch in its collection. Each watch will therefore have its own Swiss Kubik case, and it will potentially require as many Swiss Kubik watches as automatic watches. This Swiss Kubik watch winder will turn the oscillating weight and luxury mechanical watches will thus see their Swiss calibre working permanently, which will not freeze their gears or their oils. The watch winders for Swiss luxury mechanical watches are therefore an essential complement to their original case, as well as a second case which, rotating, increases the lifespan of this beautiful watchmaking. 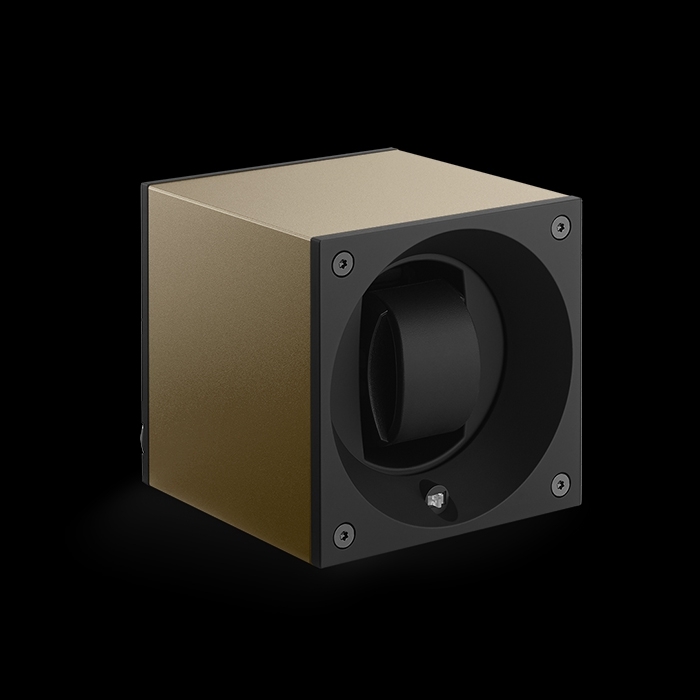 Each Swisskubik watch winder, from the Swiss Kubik collection or other, is available in black or in another colour, in the form of a rotating cube. This Swiss made rotary cube is made of aluminium. Why aluminium? Because it is a metal as light as it is non-magnetic and resistant. Aluminium is sometimes used in Swiss watchmaking for certain luxury watches, black anodized or in its natural state. This Swiss Made aluminium rotary cube is then set in motion by a set of batteries or on mains. The batteries give him the autonomy to take his luxury watches with him in their winders. It takes two batteries (alkaline batteries) to operate the Swiss Kubik watch winder for several years - a very long life for a battery system, the result of the excellent Swiss design of these winders. Among the Swiss brands that make the watch winder a speciality, Swisskubik, with its swiss kubik, has a special place in watchmaking, having made its case both a luxury object and an aluminium case tailored for everyday use, light to carry thanks to aluminium, autonomous with its batteries, of a beautiful luxury thanks to its leather finish or the elegance of its black, all in Swiss quality. Put into rotary motion, the Swisskubik Swiss kubik renews the exercise of the watch case, with the pleasure of always finding, thanks to its rotating system on mains or battery, a luxury watch or watches always on time and with an optimized lifespan.